Ever noticed how adding the suffix -ette to a word makes it cuter, more diminutive or dare I say, darling? Rock+ette= those lovely leggy dancers. So much more fun to watch than a rock. Flower+ette= something already lovely made smaller, likely more abundant and presumably cuter. Kitchen+ette= that room from whence food comes compacted to an easier to manage & easier to clean size. 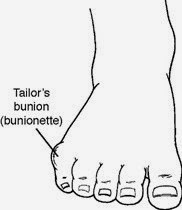 Bunion+ette= a foot deformity not near the big toe like a regular bunion, but by the little toe or metatarsophalangeal joint. I have a bunionette on my left foot from too many years working in retail, performing as a dinner theatre actress and wearing high heels. Also, my left leg may be a tiny bit longer than my right leg, and I have flat feet with wide toes, which certainly doesn't help my pitiable foot situation. My bunionette is neither precious, nor darling. It is not dimuniutive. My bunionette is red, inflamed, angry and seems to be growing. It may be time for yours truly to get a desk job. 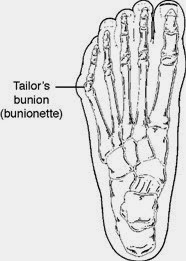 I wonder if I can start a crowdsourced funding campaign for my future bunionette correction surgery and physical therapy? Most importantly, where can I buy cute and stylish orthopedic shoes? Click here for more fascinating facts about bunionettes.